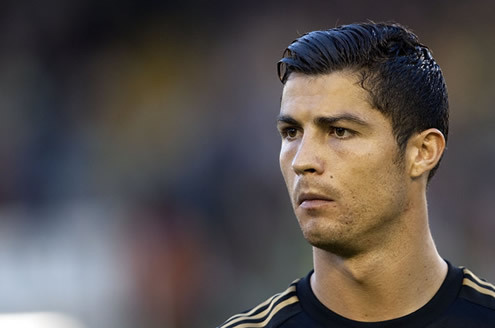 Real Madrid couldn't get more than a goalless draw from tonight's game against Racing Santander. The Merengues dropped 5 points in the last 2 fixtures, which may turn out to be decisive in the end of the season. Cristiano Ronaldo didn't manage to change the course of the events. After losing to Levante in the last weekend (1-0), Real Madrid now dropped 2 points in Santander, against the local team, Racing. In a game where José Mourinho men had a ball possession percentage close to 70%, they failed to create good goal scoring chances and to really test their opponent's goalkeeper. Cristiano Ronaldo didn't have a very good night, similarly to the rest of the team, who didn't show enough capacities to create dangerous plays near Racing Santander's area. José Mourinho decided to make a few changes for this game against Racing Santander. Varane, Lassana Diara, Arbeloa and Callejón jumped to the line-up, replacing Pepe and Fábio Coentrão (both picked up injuries in the game against Levante), as well as Sérgio Ramos and Angel Di María, who got benched. The first half was played in a very slow rhythm and despite Real Madrid's control of the game, the Merengues always felt powerless to put Racing Santander against the ropes, as they were never close to score. The second half promised to be very different and Angel Di María replaced Callejón, in an attempt to put more dynamism in the front of the attack. The Merengues were trying to speed up the pace of the game, but they kept struggling to create goalscoring chances, while time was running out. Mourinho then called Higuaín and Kaká to the game, but the team kept showing worrying signs of being too inofensive in the attack. Cristiano Ronaldo had a few attempts, but the closest CR7 got to threat Racing Santander's goalkeeper, was by taking free kicks, which invariably ended by hitting someone in the freekick wall, or going well far from the target. However, in one of those freekicks taken close to the end of the game (around the 89th minute), Real Madrid players complained about a handball inside the penalty area, which the referee ignored and simply waved to play on. The game turned out to be frustrating and ended with a goalless draw (0-0). Real Madrid has now completed 180 minutes without scoring a goal, resulting in losing 5 points for the Spanish League title race. In a league where the champion usually doesn't lose many points, these slips can turn out to be dangerous in the end of the season. Let's hope Real Madrid and Cristiano Ronaldo get back on tracks in the next match, as the Merengues will host Rayo Vallecano this Saturday, in the Santiago Bernabéu for La Liga. Casillas; Marcelo, R. Carvalho, Varane, Arbeloa; Lass Diara, Xabi Alonso, Ozil; Callejón, Cristiano Ronaldo and Benzema. Real Madrid next opponent is Rayo Vallecano, next Saturday (24-09-2011). You can watch Real Madrid vs Rayo Vallecano live streams, inside our Live Games Streams section. Cristiano Ronaldo is expected to in the line-up. The countdown clock timer, displaying the time left for the next Ronaldo game, is shown on the top right corner of all pages. Remember that this Saturday, besides Real Madrid game, you can also watch Barcelona vs Atletico Madrid and Stoke City vs Manchester United, in our "Live" section.